For both small and growing businesses, a hosted e-commerce provider such as Shopify can help your business grow further, and with the proper Shopify developer your business can go from a Raleigh, NC storefront to all over the world. When looking for certified, trustworthy Shopify developers, Raleigh NC businesses can confide in Look To The Right’s team who focus on the specific needs and characteristics of your business, in order to create the best possible shopping experience. You need to evaluate all of the development options available when planning your new e-commerce store. As one of the world’s leading e-commerce website platforms, Shopify provides a secure and easy to manage combined e-commerce and CMS solution. This fully functional, easy to use e-commerce platform is preferred by thousands of businesses around the world due to its unique functionality and customized themes that enable service-based businesses to offer online bookings, tickets and selling services through a scalable, highly customizable and secure platform. The Shopify APP store, for example, provides a myriad of tools made to support your business online. Its API Data Integrations option allows you to integrate and automate data transfers and synchronisations between Shopify and your business management tools. This eliminates human error and provides a safer user experience. Additionally, features such as shopping cart, universal login, SEO and SEM optimization, server management and hosting make this a great tool for businesses looking to expand their online presence. With the help of the right Shopify developer, you can be certain you’ll put yourself above your competition. When handling Shopify development for Raleigh NC businesses, you need to work with only the best. At Look To The Right, we employ the most highly trained Shopify developers Raleigh, NC has to offer, making sure to tackle every aspect necessary to make your website stand out. Given that web design is an important part of Shopify development, there are three divisions of it in which we focus. Design is crucial for creating a good first impression. This is key in the world of online marketing and the most important aspect of your overall website. This covers everything from fonts to graphical elements and calls to action. 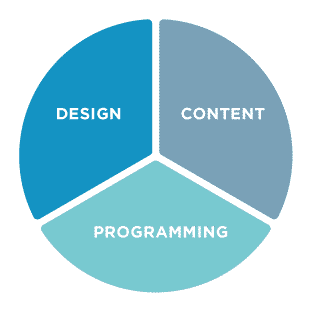 At least a third of all overall project costs are devoted to design. Content is the reason people visit your website. Though usually in text form, it can also include images, video, audio and everything necessary to communicate your what your business is in a clear and concise way that will convince your target audience of why they should choose you over your competitors. Programming is what goes on behind the scenes, the technical aspect of your website that allows you to create customized, unique functions. A great programmer is one who brings your web design and content-related ideas to life by incorporating security features, custom functionality, tracking and more. This ensures your Shopify development project covers all of the bases necessary. Once choosing Shopify as your e-commerce tool, you’ll need to take advantage of all platform functionalities in order to make your new online store stand out. In order to make this happen you’ll need the best team to help you create a Shopify development project that covers all the bases. Fortunately, when it comes to finding the right Shopify developer, Raleigh NC customers rely on LTTR’s expert assistance. Whether you’re making small changes to an already built e-commerce or creating a completely new Shopify development project from scratch, we’ll guarantee that your goals are met. Contact LTTR today to find out more about how we can take your Shopify development project to the next level.